Submarines are watercrafts that can operate totally independently underwater. 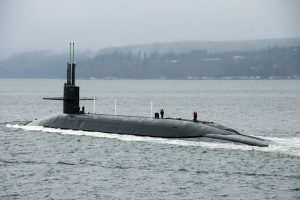 The existence of the submarine goes back beyond the 19th century, but the design of these vehicles was adopted by different navies around the Globe only starting with World War I. They were used together with other surface ships and air force for reconnaissance, insertion or Special Forces, for nuclear strikes when that technology became available, blockades. Nowa days civilian submarines are used for scientific studies, explorations, facility inspections, maintenance or search and rescue missions, underwater cable repairs, archaeology and even tourism. The vehicle itself is something of a special and clever design. They mostly are of cylindrical shape, have a special pressurization and depressurization room, use a periscope to see details from above the sea level, and have ballast tanks filled with either water or air to decrease or increase the buoyancy to sink or float. The sailor crew number varies on the mission type. They can be only one or two sailors aboard a small vessel, which would have a mission that would last only a few hours, or extend to hundreds. The last example is the Russian Typhoon class of submarines, the biggest class of submarines ever built, which can remain submerged for as long as half a year. The sailors aboard submarines, unlike the ones on vessels floating on the water, are totally isolated from contact with the outside world. The radio communication is the only type of communication possible, but sometimes it might be prohibited due to the specific mission terms. For many years, women were not allowed to serve on submarines. But starting in 1985, the Royal Norwegian Navy allowed to raise the ban and permitted female military to have the same equal chances to be evaluated with the other candidates. The Swedish Navy followed in 1989, Royal Australian Navy in 1998, the German Navy in 2001, the Canadian Navy in 2002 and the US Navy in 2011.